The North American Aerospace Defense Command has today announced its intention to track the Rapture, as a curtain raiser to tracking the End of the World. Commencing at 6pm on Saturday the 21st May, NORAD will use it’s highly acclaimed “SantaTracker” network of satellites and webcams to follow the Rapture from it’s beginning in Fiji and New Zealand and on, through the Far East, Asia, Europe and finally to the United States of America. 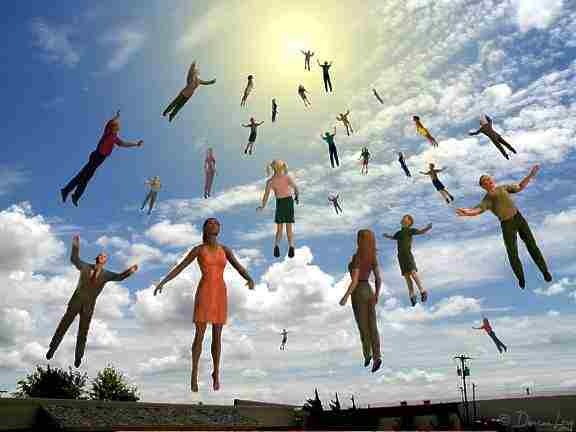 It is expected that the Rapture will change speed as it travels the world time zones. This may mean that the Rapture arrives a little earlier or later than expected in your local time zone, and so you should be prepared a little early, and not be too disappointed if you are still here a little later than you expect. This is due to the logistics of transporting the various population densities of expected “rapturees” in various parts of the world. Clearly, for example, the Rapture will move speedily through Europe, especially because the Catholics are not going, but slow down massively when it hits the East Coast of the USA, slowing almost to a crawl when it hits Tulsa, but then speeding considerably as it mops up California. Travel arrangements have been made to accommodate the Southern Baptists, staging posts might be required. NORAD has been told to expect that they will not be able to use the regular “World Daylight Map”, because it will be so bright everywhere that this map will, for this day, have little meaningful use. Counselors and psychiatrists have been stationed at Post Offices all over the USA to deal with the disappointment of Atheists when they realize that so few American Christians qualify that the GOP will probably be able to maintain it’s majority in the House, although it’s unlikely they will take the Senate. There could be an unexpected vacancy in the White House, housing as it does an actual Christian. there will be free beer in north park on saturday night, but only if the world ends. Are there any Lot’s around,because, if not then we are all doomed.Really, many are called and few are chosen. Save me a cold one,this could be when my Karma catches up with me. Glad to see that NORAD will be able to use its Santatracker system more than once a year! -Prediction #1: The Apocalypse will take place on May 21st, 2011. Mr. Camping’s followers have already paid for billboards and radio ads, it would just be stupid on my part to pick another day to predict the world to end. -Prediction #2: The dead will rise from their graves to walk the Earth. However, instead of devouring human flesh these Zombies will all develop severe chronic fatigue syndrome and simply return back to the Earth. -Prediction #3: Though Jesus will not make his return to Earth, actor Jerry Lewis will make an early return to television with his popular Jerry Lewis MDA Telethon. 45 years and counting! -Prediction #4: You can gain Salvation but not through constant repentance for your sins. Rather you can only gain Salvation by signing up for a free trial on Netflix, where 2009?s Terminator Salvation will be streaming for free! -Prediction #5: A select few Evangelicals will all ascend to their own ideal heaven where they will watch television for hours, eat junk food, donate money to various unspecific causes, and predict a 2nd apocalypse. -Prediction #6: After several months of suffering, a great sense of calm will envelope the Earth. It is at this time that Love will become the only form of currency…that is to say, the only form of currency other than Cartons of Cigarettes. -Prediction #7: As Fire and Brimstone fall forth from the sky, local Weathermen come up with very entertaining things to say. For those of you who want to perform a last-minute wedding in our last few days on Earth (or want to score some last-minute points with the big guy upstairs), become a minister for free at themonastery.org. Prediction #8: Spaceman was telling the truth. The departure point has been changed. The new deperture point is the “Salty Dog”. I think. Commander Greg XIB/23 please post a note on the Rag and let Rick Ward know how to contact Commander Greg. I need you to go to the garage on Saratoga St. and locate my Space Card. Ask Paige or Jackie if it’s OK.
Frank, This is probably not that important,but, here goes. In the summer of “Stop the Jetty.” Space was painting a 4 by 8 piece of plywood that was nailed to the wall of The San Vicente Inn.In the parking lot. And I was assisting. Well, I asked Spaceman what his space # was. (Here’s why I remember) He,Spaceman , said( Not in quotes. but bear with me here.) . Spaceman said his Space Number was XIB/2. And when I queried him about who was XIB/1 , he told me in no uncertain terms that God was XIB/1. I’m not trying to start a ruckus or anything, but either you disremember, or Clint was huffin’ Tolulene or something. I know I have a couple of “Space Numbers” just in case. I’m sorry for putting this out in public but readers of the Rag deserve to know the truth. Okay, okay, maybe it was xib/20. Fun article! I was wondering if NORAD would dust off the Santa Tracker for this. I wish, however, that the author would have consulted a proofreader. There’s a glaring punctuation/usage error in the first line. 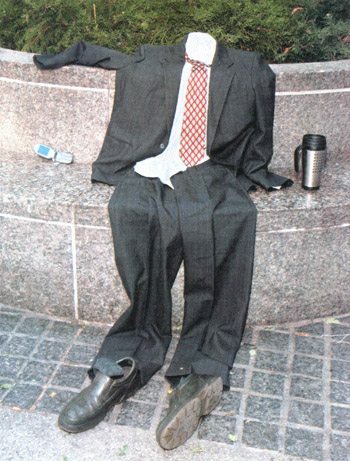 I like the photo of Mitt Romney…. Where did everybody go? I am alone, but I am not sure I am in heaven? yay if this happens no more tea party holding up progress. Newer Article: Please don’t harass the patients.